Homemade Condensed Cream of Mushroom Soup is satisfying on so many levels. It is creamy and delicious, it pairs with so many dishes, and there is a sense of satisfaction that you get knowing that all of the ingredients are whole and healthy. There is something so satisfying about true from-scratch cooking. Knowing every single item that goes into your meal adds a layer of pride to cooking that can’t be replaced with the store-bought version. 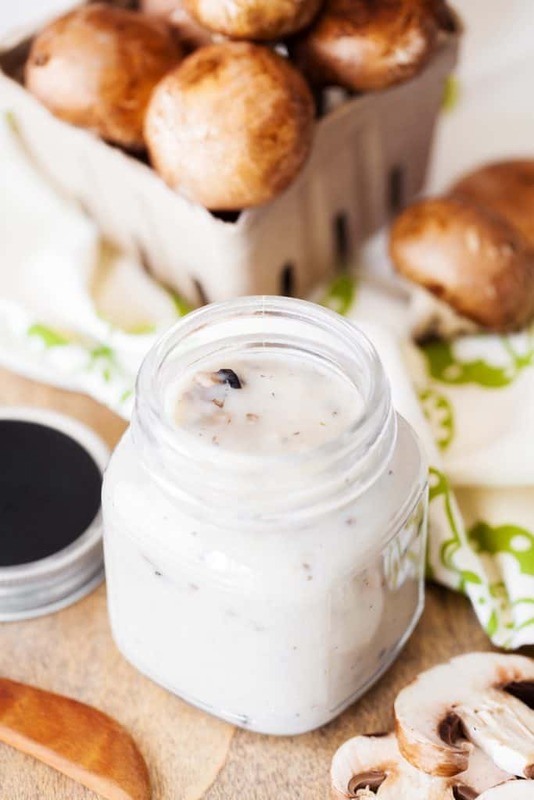 Use it in all of your favorite recipes that call for condensed cream of mushroom soup and you will never go back to the canned stuff. The best part about making cream of mushroom soup at home? It can be made fresh and used immediately. No more wondering how long the cans have been sitting on the shelf. 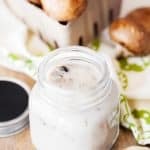 What Can I Make with Homemade Condensed Cream of Mushroom Soup? Ummmm, anything? This is a base that is so versatile! Pork Chops, Chickens, Casseroles, even Sloppy Joes if you want to get fancy! 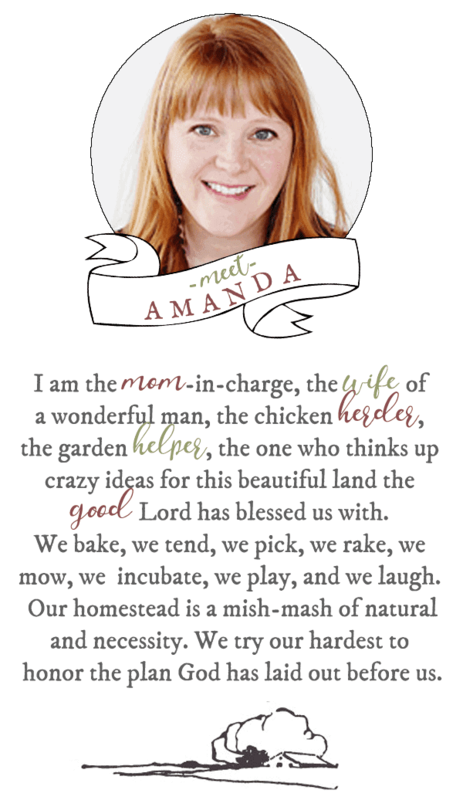 We use it in Tater Tot Hotdish, Slow Cooker Chicken and Noodles, and Easy Hamburger Stroganoff. Can I make Baked Pork Chops with Homemade Cream of Mushroom Soup? This is seriously one of my favorite ways to use this recipe. My family loves Cream of Mushroom soup paired with Pork Chops. There are plenty of variations out there, but we typically season the chops with salt and pepper and then brown them in a skillet. After they are brown on the outside, we put them in a baking dish and smear on the Cream of Mushroom soup recipe. Don’t worry about diluting it, the juices from the chops should do the trick. Cover the pan tightly with tin foil and then pop them into an oven preheated to 350° Fahrenheit. How do I make Gluten Free Cream of Mushroom Soup? If your diet or lifestyle calls for Gluten-Free, we have got you covered. Gluten-free cream of mushroom soup takes less than 20 minutes to make and the creamy fresh flavor is so worth it! The flour in this recipe can be swapped for rice flour. Overall, vegetable broth is likely to be gluten-free naturally, but some manufacturers add a yeast extract that contains wheat. You will have to carefully read the ingredients to be sure. Just follow the recipe and swap out the necessary ingredients and enjoy! It may seem like a silly question, but it is one that I get quite often. Mushrooms grow low to the ground, so they get pretty dirty. Even the mushrooms you purchase at the store need to be cleaned. The trick to cleaning mushrooms is to use a damp paper towel and rub lightly, one at a time. Do not soak them or rinse them. 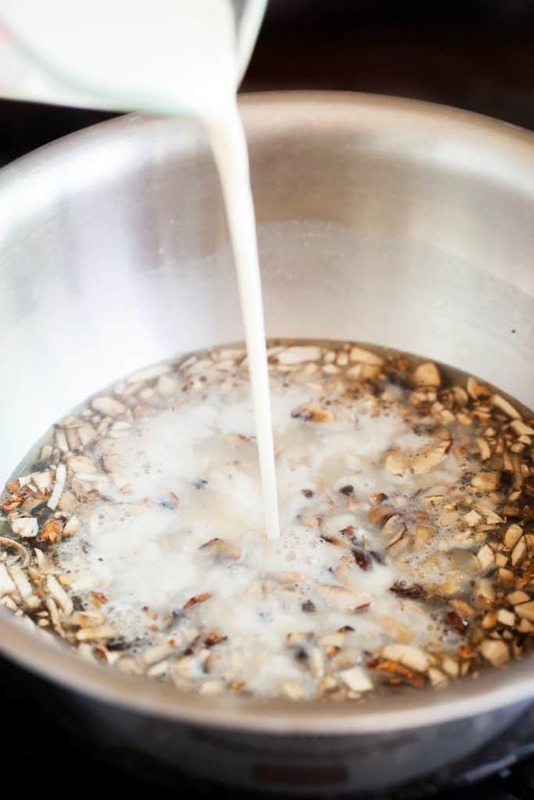 Mushrooms will absorb liquid and they will lose texture and flavor if you submerge them in water. Once they are cleaned, sit the mushroom on its side and with a very sharp knife, make thin slices from end to end. This recipe is so easy, there are not many tools required. I do live by a few handy tools that are staples in my kitchen though. My knife sharpener came in handy this time around because to get a really good thin slice of mushroom, you need a really sharp knife. In a small sauce pan, bring the broth to a boil. Stir in the mushrooms, onion and garlic powder, celery salt, salt, and pepper. In a small bowl, whisk together the flour and milk until smooth. Pour into the sauce pan and stir to combine. Reduce the heat and allow to simmer until thickened, stirring constantly. Use immediately or store in the refrigerator in an airtight container. Did You Make Condensed Cream of Mushroom Soup? How long will this stay good in the refrigerator. This will stay fresh as long as the expiration date of the milk that you use. Usually a couple of weeks. I’ve never tried it but I bet it can! Do you have GF recipe for Cream of Chicken. I’m GF and always looking for a good recipe but cannot find Cream of Chicken soup yet that’s GF. Also, I use the Pillsbury GF flour but everything I make is so dry. What can I add to cakes & etc to bring back “moist” to my cakes, cookies and etc. Should I add oil??? Above is the gf recipe she said to use rice flour. Would one add a like amount of liquid to make soup if one just wants a bowl of soup?? Can the completed condensed soup product be frozen and thawed for use later or do you think it would separate? Just curious! Want to try this, but I have one questions. Your list of ingredients refers to garlic salt, but under instructions it is called garlic powder. Which one should I use? Hello! For the baked pork chops, do you season the chops? Also how long do you bake at 350 for? I’d really like to try them! Thank you! Love your website. Would like to make this recipe. Do you use garlic powder or garlic salt? Ingredients indicate garlic salt and instructions indicate garlic powder. Using salt over powder makes a difference. Also, if I want to just eat as a bowl of soup do I have to dilute the soup and if so what ratio?